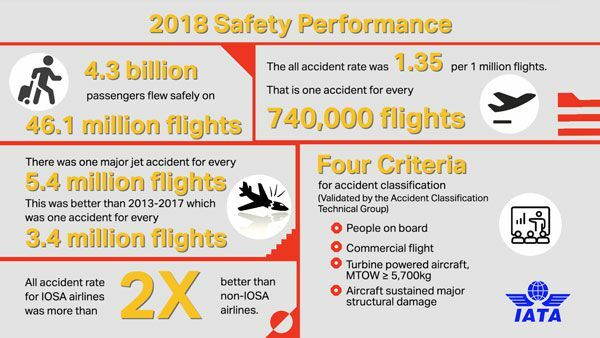 The International Air Transport Association (IATA) released data for the 2018 safety performance of the commercial airline industry showing continuing safety improvements over the long term, but an increase in accidents compared to 2017. The all accident rate (i) (measured in accidents per 1 million flights) was 1.35, which was the equivalent of one accident for every 740,000 flights. This was an improvement over the all accident rate of 1.79 for the previous five-year period (2013-2017), but a decline compared to 2017’s record performance of 1.11. The 2018 rate for major jet accidents (measured in jet hull losses per 1 million flights) was 0.19, which was the equivalent of one major accident for every 5.4 million flights. This was an improvement over the rate for the previous five-year period (2013-2017) of 0.29 but not as good as the rate of 0.12 in 2017. There were 11 fatal accidents with 523 fatalities among passengers and crew. This compares with an average of 8.8 fatal accidents and approximately 234 fatalities per year in the previous five-year period (2013-2017). In 2017, the industry experienced six fatal accidents with 19 fatalities, which was a record low. One accident in 2017 also resulted in the deaths of 35 persons on the ground. “Last year some 4.3 billion passengers flew safely on 46.1 million flights. 2018 was not the extraordinary year that 2017 was. However, flying is safe, and the data tell us that it is getting safer. For example, if safety in 2018 had remained at the same level as 2013, there would have been 109 accidents instead of 62; and there would have been 18 fatal accidents, instead of the 11 that actually occurred.” (ii) said Alexandre de Juniac, IATA’s director general and CEO. “Flying continues to be the safest form of long-distance travel the world has ever known. Based on the data, on average, a passenger could take a flight every day for 241 years before experiencing an accident with one fatality on board. We remain committed to the goal of having every flight takeoff and land safely,” said de Juniac. Six regions showed improvement or stayed the same in 2018 compared to the previous five years (2013-2017) in terms of the jet hull loss rate. The world turboprop hull loss rate was 0.60 per million flights, which was an improvement over 1.23 in 2017 and also over the five-year rate (2013-2017) of 1.83. All regions except for Middle East-North Africa saw their turboprop safety performance improve in 2018 when compared to their respective five-year rates. 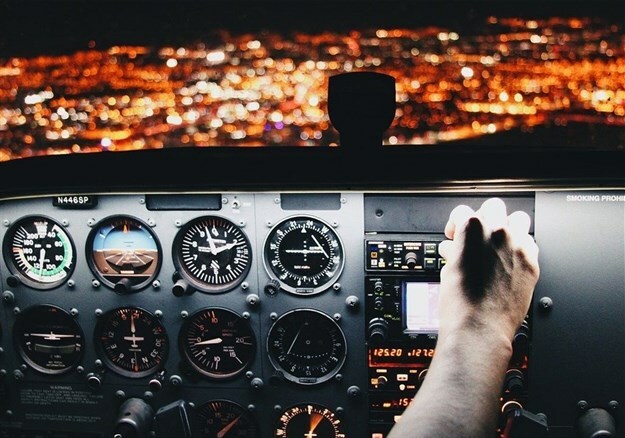 Accidents involving turboprop aircraft represented 24% of all accidents in 2018 and 45% of fatal accidents. For a third consecutive year, airlines in sub-Saharan Africa experienced zero jet hull losses and zero fatalities in jet operations. The all accident rate was 2.71, a significant improvement over the rate of 6.80 for the previous five years. Africa was the only region to see a decline in the all-accident rate compared to 2017. However, the region experienced two fatal turboprop accidents, neither of which involved a scheduled passenger flight. “We continue to progress in the region toward world-class levels of safety. But, despite improvement there is still a gap to cover in the safety performance of the continent’s turboprop fleet. Global standards such as the IATA Operational Safety Audit (IOSA) are making a difference. Counting all accidents, the performance of African airlines on the IOSA registry was more than twice as good as non-IOSA airlines in the region. “In parallel, African governments must accelerate the implementation of ICAO’s safety-related standards and recommended practices (SARPS). As of year-end 2017, only 26 African countries had at least 60% SARPS implementation. They also should incorporate IOSA into their safety oversight systems,” said de Juniac. In 2018, the all accident rate for airlines on the IOSA registry was more than two times lower than that of non-IOSA airlines (0.98 vs. 2.16) and it was more than two-and-a-half times better over the 2014-18 period. All IATA member airlines are required to maintain their IOSA registration. However, 2018 IOSA calculations are impacted by the fatal accident involving a Global Air aircraft that was leased, along with crew, to Cubana. Because Global Air is not on the IOSA registry, the accident is not considered to have involved an IOSA airline, even though Cubana, as a member of IATA, is required to be on the IOSA registry. There are currently 431 airlines on the IOSA Registry of which 131 are non-IATA Members. The IOSA program is undergoing a digital transformation that will enable IOSA airlines to compare and benchmark their performance. In the long run, the digital transformation will help to focus auditing on areas with the highest level of safety risk. IATA’s Global Aviation Data Management (GADM) program is the world’s most diverse aviation data exchange program. Data captured in GADM databases comprises accident and incident reports, ground damage occurrences and flight data from more than 470 different industry participants. “Through GADM, we are using information from the more than 100,000 flights that operate safely every day to identify and address operational issues before they can become potential risks,” said de Juniac. The Flight Data Exchange (FDX) platform contains de-identified information from 4 million flights. Additionally, with the imminent introduction of Incident Data Exchange (IDX), participants will be provided with enhanced data analytics and benchmarking capabilities with aggregated de-identified global safety data. IATA has also been working with more than 100 aviation safety professionals on the IATA Safety Incident Taxonomy (ISIT). The ISIT will provide the ability to better capture global risk at a more granular level. One well-known hazard is inflight turbulence. As passenger and cabin crew injuries related to in-flight turbulence climb, IATA sees a need to address this increasing safety risk. In response, IATA has launched Turbulence Aware, a global platform for sharing automated turbulence reports in real time. Operational trials with a number of airlines are being conducted this year, with full launch planned for 2020. Person(s) have boarded the aircraft with the intention of flight (either flight crew or passengers). The intention of the flight is limited to normal commercial aviation activities, specifically scheduled/charter passenger or cargo service. Executive jet operations, training, maintenance/test flights are all excluded. The aircraft is turbine-powered and has a certificated Maximum Take-Off Weight (MTOW) of at least 5,700KG (12,540 lbs.). The aircraft has sustained major structural damage exceeding $1 million or 10% of the aircraft's hull reserve value, whichever is lower, or has been declared a hull loss. (iv) Fatality risk measures the exposure of a passenger or crew to a catastrophic accident where all people on board the flight are killed. The calculation of fatality risk does not take into account aircraft size or how many were on board. What is measured is the percentage of those on-board who were killed. This is expressed as fatality risk per millions of flights. The 2018 fatality risk of 0.17 means that on average, a person would have to travel by air every day for 241 years before experiencing an accident in which at least one passenger was killed. On average, a person would have to travel every day for 16,581 years to experience a 100% fatal accident.